The flood threat eased in South Texas on Monday as runoff moved downstream following weekend downpours that destroyed some houses and led to numerous high-water rescues. As much as 17 inches of rain fell early in the weekend, with the heaviest rain falling about 50 miles west of San Antonio, said Pat McDonald, a National Weather Service forecaster in San Antonio. "It's hard to look at, when you walk in that kitchen and where I cook and you see everything upside down and all that mud," D'Hanis restaurant owner Bill Keich told CBS News correspondent Hari Sreenavasan. 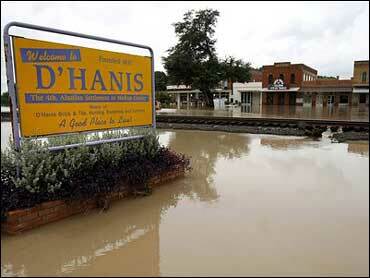 D'Hanis is about an hour west of San Antonio. By Monday, high water posed little threat to homes but was a problem for some recreational areas and ranches. "We were concerned about the Medina River, but that crested last night without flooding," Medina County Sheriff Randy Brown said Monday. Only isolated showers are forecast through Tuesday, but several Central Texas rivers were either at flood stage or expected to reach that level Monday through Thursday, the weather service said. Some major flooding was possible in the Nueces and Guadalupe river basins later this week, according to forecasts. Medina County saw the heaviest rain and worst flooding Saturday, especially along Sego Creek, which flows through D'Hanis. There were no estimates of the number of homes destroyed by the flood, but Brown said he believed it was more than a dozen. No injuries were reported, but as many as 90 people sought emergency shelter, he said. Dozens of people were rescued, some by helicopter, but no serious injuries were reported in the state's latest round of flooding. A Boy Scout troop had to flee a campsite along the rapidly rising Guadalupe River on Saturday, and an Amtrak train was halted by water on the tracks about 75 miles west of San Antonio.